To be unprofessional is not to be disrespectful. It is not to be reckless or lazy. It is not to be unpunctual, badly presented or poorly spoken. To be unprofessional is to be real. It is to create a vision that is unborrowed from the past. It is to develop products that genuinely ‘wow’ your audience. It is to think of marketing strategies that the management consultants don’t have diagrams or buzz words for yet. It is to think original thoughts and speak of proactive ideas that haven’t yet been documented in the academic playbooks. At just 26 years old, Jack Delosa knows more than you’d expect about business and entrepreneurship. A self-made millionaire by 24, Delosa is an award-winning entrepreneur and educator who has built several start-ups into successful thriving businesses. 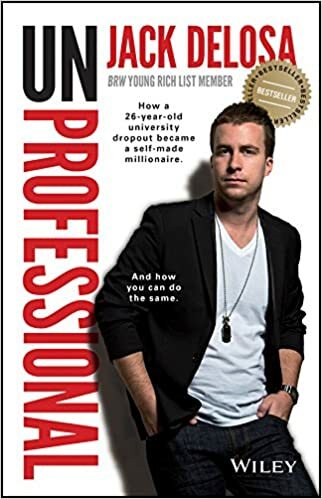 In UnProfessional, Delosa reflects on his business adventures and offers practical how-to advice on topics such as becoming a market leader on a shoestring budget, becoming the go-to person in your industry to win more business faster, how to manage and lead other people toward your vision and why it’s important to fail fast. The business world has changed. What worked in the past will not work today. Offering a fresh perspective on the challenges of starting and running a successful business, UnProfessional is an ideal guide for Australia’s current crop of forward-thinking entrepreneurs of any age.